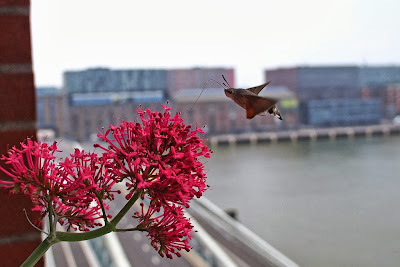 The hummingbird hawk-moth was @SpeciesofUK from 28th July to 3rd August, 2013. There are over 2,400 species of moth in the UK. The hummingbird hawk-moth is one of the most unusual-looking. The hummingbird hawk-moth is a member of the Sphingidae family, alongside 1,450 other hawk moths, hornworms and sphinx moths worldwide. Most Sphingidae are found in the tropics, but seventeen are seen regularly in the UK. 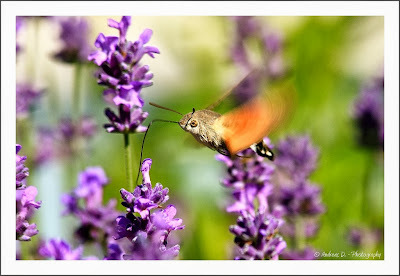 The hummingbird-hawk-moth is present across Europe, wherever nectar-bearing flowers can be found. It can be found in mountains and in city centres, as long as it can find flowers with nectar. 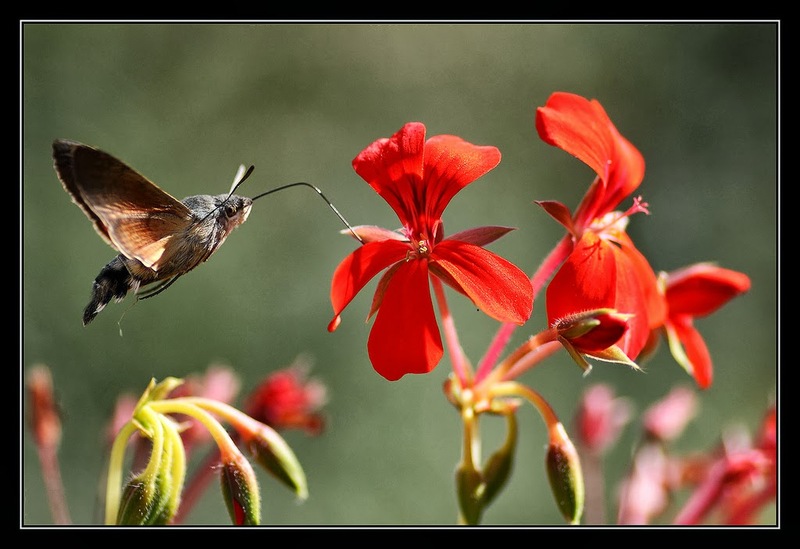 In the south of its range, the hummingbird hawk-moth has three or four broods in a year and semi-hibernates during winter. 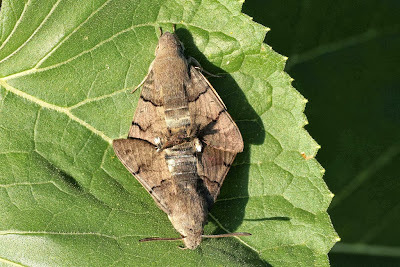 In the north of its range, such as in the UK, the hummingbird hawk-moth is a migrant, appearing in April or May and raising two broods, one in June and one in August or September. Hummingbird hawk-moth immigration to the UK fluctuates quite a lot annually. Large influxes occasionally occur, such as in 2000 and 2006, when it was a common sight in gardens. You’re unlikely to confuse a hummingbird hawk-moth with any other species of moth. 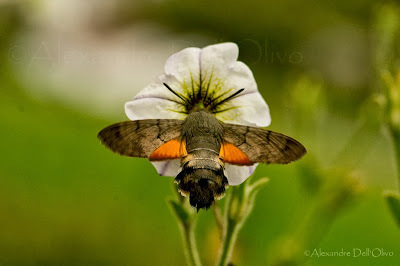 The hummingbird hawk-moth is very distinctive. It has a brown, white-spotted abdomen, brown forewings and orange hind-wings. It doesn't vary in colouration much, although you can sometimes see pale albinistic specimens and occasionally individuals with blackish abdomens. 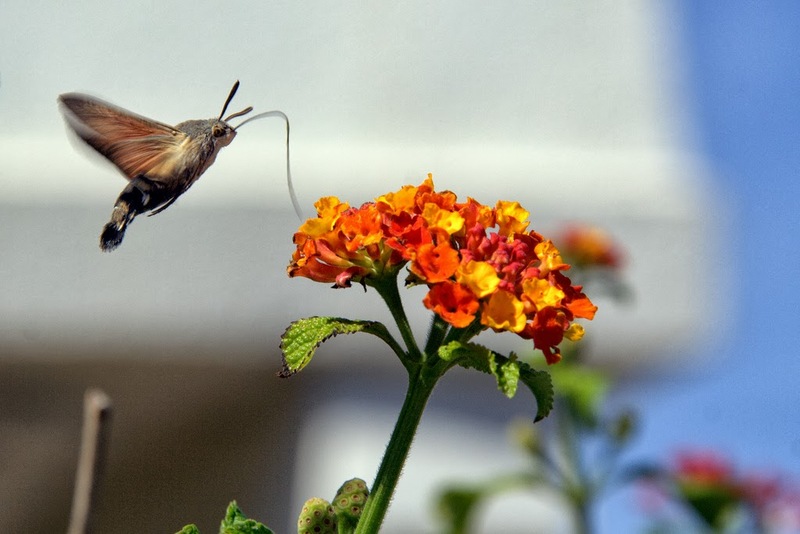 The hummingbird hawk-moth is named for its startling resemble to a hummingbird. It has long proboscis which it uses to probe flowers and collect nectar, and it hovers just like a hummingbird, accompanied by an audible humming noise. It is attracted to high nectar-yielding flowers, such as Jasminum, Buddleja, Nicotiana, Tulipa, Primula, Viola, Syringa, Verbena, Echium, Phlox and Stachys. It hovers in front of each bloom and repeatedly probes it, before darting rapidly to the next. The ability to hover is an example of convergent evolution. It evolved independently in hawk-moths, hummingbirds, honeybees and certain bats. 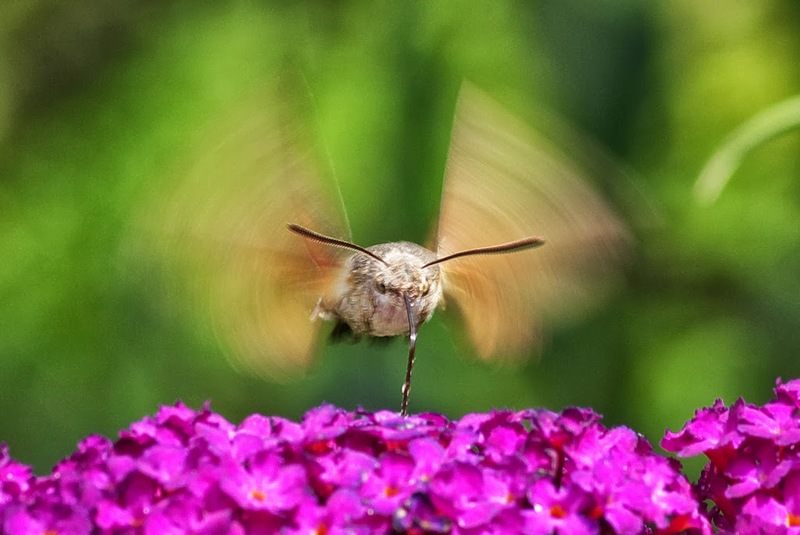 The hummingbird hawk-moth has well-documented visual abilities. It learns colours and tracks the flowers it visits so it doesn't waste time sampling an empty flower. It tends to return to the same flower-beds every day at about the same time. The hummingbird hawk-moth flies mostly in bright daylight, although it will sometimes venture out in other conditions. In very hot weather, it becomes torpid and restricts its activity to early morning and late afternoon. Hummingbird hawk-moth courtship is an incredible sight. Hummingbird hawk-moths dash around after each other rapidly when in courtship. They have the remarkable ability that they can continue to fly while in copula, even going so far as to keep feeding. When the female is ready to lay her eggs, she finds patches of Galium or Rubia and lays up to two hundred ova, one on each flower-bud. It’s a painstaking process. 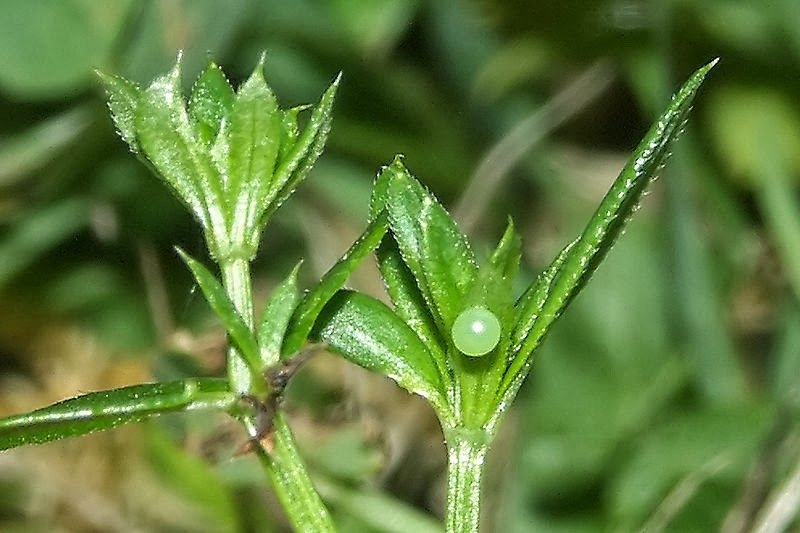 Galium is a popular choice because the moth’s eggs resemble the plant’s unopened buds. The egg hatches after six to eight days. The newly hatched larvae are about 2-3mm in length, cylindrical and yellow. 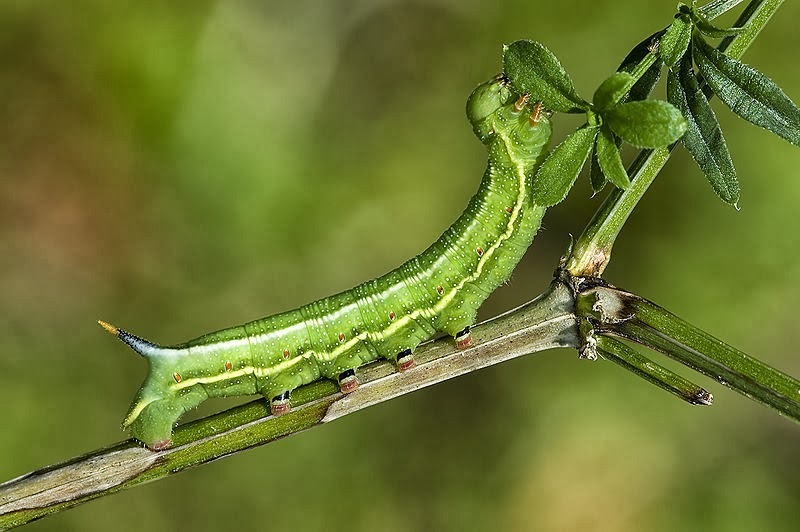 The hummingbird hawk-moth larvae eat voraciously. In the second instar (moult), hummingbird hawk-moth larvae turn green with yellow dots. Two bands (dorsal and ventral) of cream-bordered grey run from head to horn. 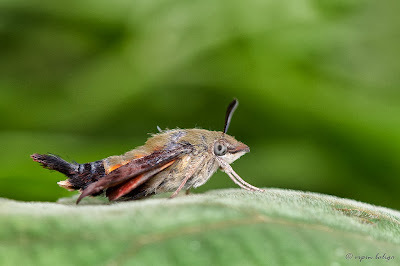 As the larvae develop the tail horn changes from purplish red to blue with an orange tip. Occasionally the green body turns reddish brown. 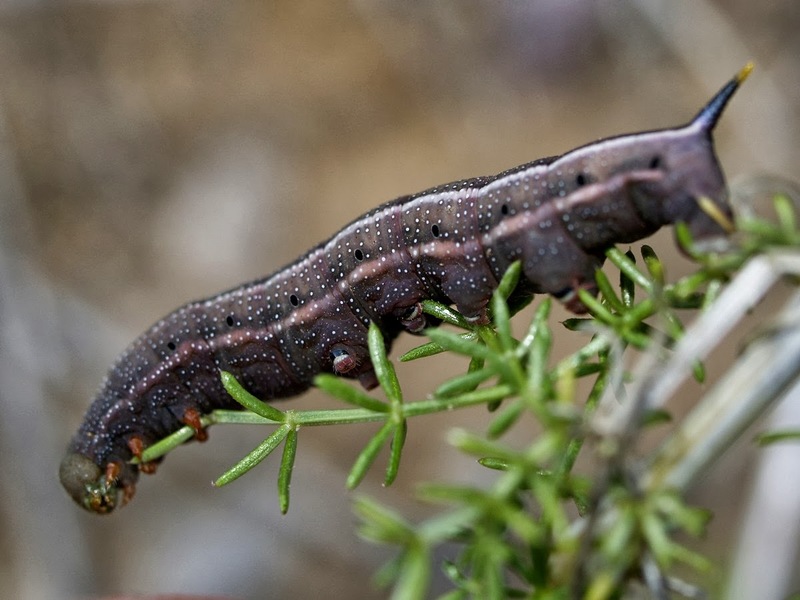 Hummingbird hawk-moth larvae can often be seen alongside D. porcellus larvae (the small elephant hawk-moth), as they favour the same habitat. 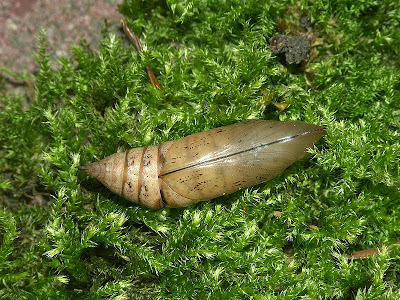 When the hummingbird hawk-moth pupates, it becomes a pale translucent brownish cream, with a scattering of darker brown. The proboscis is prominently visible. The pupa is enclosed in a silken cocoon spun low down among the host plant, or among debris on the ground. In America, moths of the genus Hemaris are called “hummingbird moths." But they're unrelated to the hummingbird hawk-moth.